Film solves a lot of problems, of course, but also creates difficulties… including a steeper learning curve (no results until the film is developed), and won’t solve the problem of getting very long exposures when light pollution or moonlight are present – in those cases long exposures must by necessity either over expose the sky, or use an f-stop so small that no stars will be present. Stacking shorter digital exposures solves the long exposure problem quite elegantly. One bright light accidentally aimed into a long film exposure destroys hours of work. Going the digital route with stacking, you may lose one frame. It’s actually more of a question. I live in Arkansas, with very high heat indexes and 100% humidity during the late spring and all summer. By far here the best time to shoot is winter, early spring and fall. You mention shooting several 8 minute segments, which you then stack. When you are shooting this long a segment, are you using LENR? or in certain temps can you get a clean enough 8 min exposure? Or do you take a manual dark frame at the end of the series and then subtract it. I have been working with night photography now for a little over a year. Most of the time I prefer to shoot a longer single segment as a raw file as it seems to me that the overall image quality is much better (using a 5D MKII or 1D MKIV). 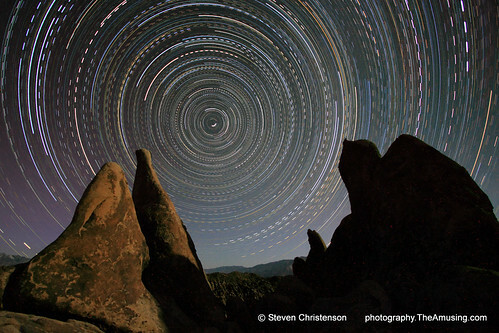 I recently started working with stacks with my 5D, shooting 25 to 30 minutes of 30″ exposures. I set the quality to Ljpg instead of raw and left LENR off. The amount of “stuck” pixels was amazing and really ruined the shot, I also did not take a manual dark frame. I have been able to clean them up a bit, but still not very well. Do you find you get a good enough quality final image if you stack with jpgs? or do you stack raw and then then convert to jpg and then stack? But to state it in the positive: “Turn off long exposure noise reduction”. Photo 1: even describes what happened when I accidentally left LENR on. Sorry if this isn’t clear. (1) Do you find you get a good enough quality final image if you stack with jpgs? or (2) do you stack raw and then then convert to jpg and then stack? I.e. I do both as the mood or circumstance allows. The choice is easiest using RAW+JPG then I get to pick afterward. Steven, thanks for the response. when stacking. From what I have been able to read, it seems these are created by the blending mode, not the slight 1 to 2 sec pause as the shutter closes and reopens. I am working with star tracer which seems one way to get these out, however it would be nice to have a way to do it in the actions that stack. Do you have any thoughts on this? So far, I tend to always try not to stack unless the moon is so bright that it gives me no choice. Most of my stacks are 30 to 45 seconds and the gaps show up. I guess if I go with longer stacks, the gaps would still be there, but not as close together. They only show when you attempt a print or view at 100%, on the web they never show, however my main purpose is printing. The size of the gaps depends on the field of view of the lens, the direction the camera is pointed and the amount of delay between exposures. I have published work with those “gaps” in them, and in fact printed 20×30″ my Bristlecone Pine Image has those gaps too – but NO ONE notices them! Having a “less dense” sensor reduces the gaps, too. So my first answer would be to set your lens wide and your inter-shot delay as short as you can and not bother further. Second even though you can stack in screen mode and that will flow better – I don’t find the result all that pleasing. If you REALLY want to get rid of the gaps you can do what I’m attempting to do (it’s theoretical) – shoot two cameras with the same view offsetting the exposure time by about half. This method would have two huge additional benefits: the ability to dither which reduces noise, and the absence of gaps, but it’s not practical for most people. Have you tried star tracer? It will also remove the gaps, takes a bit to figure out but does work. Single biggest problem I have with it is figuring out the correct FOV. I agree that unless the image is large you won’t see them especially on the web. I guess it’s a personal thing. Have you looked at Russell Brown’s two methods? He has a video using two sep scripts loading the images from bridge and then another video that uses a photoshop extension. I have not tried either one, but I am looking into them. If you don’t mind, send me an email address and I will forward to you all the links of the items I mentioned. Thanks more info on the gaps. I agree that unless you are making a larger print, they are hard to see and for web viewing are next to impossible. Have you looked at Star Tracer? I have started to use it and have found it to be a nice addition. So far as I can tell, it won’t hard the color profile info as other tools seem to i.e. dropping everything to sRGB. Also I have found some interesting information from Russell Brown, he has two nice video’s showing some stacking solutions, the 2nd of which may not leave the gaps. I know of one other photographer here using this method. 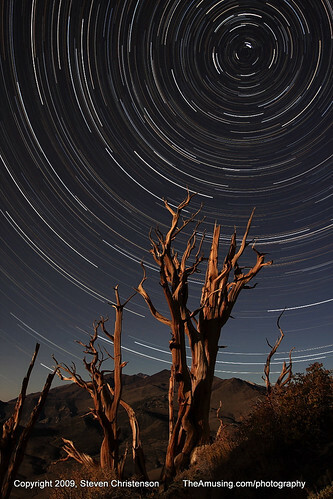 Of course, the sad issue is that Russell and Mark Johnson both have made the world aware of the star trails action built into CS5. This really allows people to just create them without much work at all, my worry being that most folks will just take the short cuts and not do the real work. If you are interested, send me an email and I will forward to you the links for the various videos and tools. 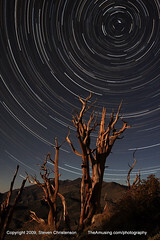 Paul, I have used Star Tracer and the photoshop action for making star trails. I found Star Tracer a bit tedious to use (though I’m generally a big fan of the utilities Max Lyons has published – Image Stacker in particular). While the Photoshop Star Trail action might seem interesting my experience is that those who use that method produce obvious forgeries (obvious to me, at least) because of the many inconsistencies that result. Photoshop allows for cheating in many other ways, so why worry about it? Indeed a more honest way to remove trail gaps is to flatten your image, slightly rotate it and blend it back with the original image. For reasons stated earlier I don’t bother to do this. NOTE: Andy posted an article explaining how to do this rotation thing (he uses radial blur). See the BLOG article. Thanks, I will have to try the rotation idea, never thought of that. I agree Star Tracer is a bit tedious. Image stacker seems to loose all the color profile and defaults everything to sRGB. I just started using bulb mode and I notice immediately that bulb lets in alot more light. if I shoot a 30sec exposure at f3.5 in bulb mode its bright and washed out. If I shoot the same settings in standard D90 30sec mode my stars look mormal. Why is bulb mode washing so badly with the same time and settings? The answer is one of two things: 1. Something is different from what you think (i.e. the ISO setting is different between the shots), or 2. The timing is incorrect. If, for example you’re shooting in time priority (T) mode for the 30 second shot you allow your camera to select f/stop and ISO whereas in manual mode you are specifying all of the settings. Make sure you’re in “manual” mode in each case and you should see identical (or nearly identical) results. If you see differences it is likely due to the errors in timing – e.g. the camera or intervalometer’s 30 second exposure might be 29 seconds or 31 seconds. Interesting bit of trivia… it’s called “bulb mode” because some of the first cameras to have an endless exposure mode used a pneumatic bulb to hold the shutter open.